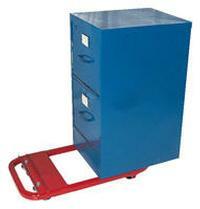 These lever action dollies are excellent for moving file cabinets, appliances, drums, crates and cartons. Heavy duty steel dolly is designed to be counterbalanced so you do not need to lift the entire weight of the load. Simply tilt the load and slide dolly under. Complete product is vinyl covered to help eliminate scrapes and scratches. Equipped with hard rubber wheels (2) 3" x 1½" axle mounted and (2) 2½" x 1¼" swivel casters.